Hello Gorgeous: HG's Helpful Hint #422. My husband is a great gift giver. Almost all of the nice things I own were gifts from him. He gave me this great bag for my birthday last year. I took it to dinner that night. The next morning, I noticed a couple of small stains on the leather (why this bag doesn't have feet is beyond me) that looked like *gasp* grease. My brand new bag was ruined. I tried to get it off with a small dab of water (which is perfect as you know because grease or oil loves water - can I say "duh" to myself here?) which only made it worse. My brand new bag was really ruined. 1) Use (alcohol- and aloe-free) baby wipes to wipe the bad spots. 2) Order Shining Monkey which is fabric protector sold for car care. Now, there are those handbag purists who will order you to never spray it with anything (including LV). Those people must be much neater than I am. In my defense, the leather on these bags stains if you look at it. You must avoid abrasive surfaces and shocks of any kind, moisture, direct sunlight and heat. So, it's the perfect purse if you live in a bubble or store your things in a vault. You're supposed to let it develop a natural patina whereby the stains, etc., darken and blend. It doesn't really happen like that. And meanwhile it looks terrible. I decided to go for it and read many, many, many reviews that confirmed Shining Monkey was the solution (well, between that and AppleGarde). It works on fabric and leather, even suede. So, I used the baby wipes to remove the stains. Then I ordered Shining Monkey here and applied it (yes, I'll admit, I was afraid) and it seems to have worked out really well. It's been a couple of months and it doesn't seem to be inhibiting the leather from achieving the patina it's supposed to achieve and I'm no longer afraid to use the bag. So, what's not to love? I have also used it on suede boots and it would be great for fabric bags and probably even the car seats for which it was originally designed. good tips, thanks! i have the tendency to trash/thrash all of my nice things. it's my trademark, i suppose. I love gathering tips like these. One of the best things about the internet is being able to search and find out how to solve these kind of problems. Here is another tip for you: toothpaste takes out sharpie marks made on hard surfaces. I am so happy that the bag is better and disaster was averted. There is nothing worse than something brand new befalling an accident - happens to me all the time, because I am always in a hurry and a bit careless! I hope Shining Monkey is available in Europe - sounds like a miracle, xv. So, Hello Monkey it is then. I need some for my car seats. It's funny, I bought my first nice handbag this year and am so paranoid about where I put it--which is probably why it took me so long to commit to spending more than 40 bucks on a bag--because I'm so rough on them! I see a bright future for these helpful hints... now can you just figure out how to remove gauges from hardwood flooring? Thanks. Also, your hubby is one spectacular gift giver! Lucky girl! hello, lovely blog! Glad you fixed your bag! Ooops! Pregnant brain strikes again... Yes -- "gouges" not "gauges." Sheesh. And thanks for posting the helpful hint on our blog!!! Lovely bag. Smart girl! 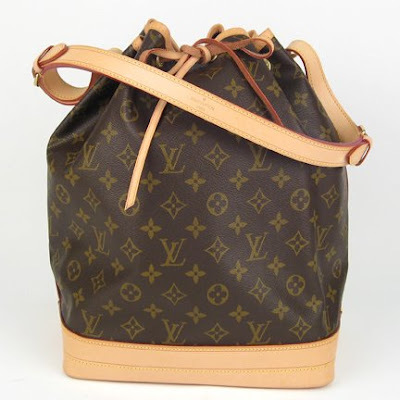 My Louis Vuitton bag was stolen several summers ago. *SIGH*. Thanks for the tips! That is one hell of a handbag you have there girlfriend. Ambika - Howdy. I know. I would never have purchased this for myself. First of all, monograms aren't usually my thing (however, this is my one exception) and, secondly, my Midwestern sensibilities won't allow me to spend this kind of money on a purse. Thirdly, it's kind of ridiculous to be worried about a purse. Hmstrjam! :-) I love that dancing cat. Erin - Hope it works. Let me know. Pam - That's terrible! I won't put it down because I'm afraid to set it in something. Ha. Dec - I know, my hubs is good to me. And he's great at choosing handbags! Now, if he could just select shoes, I'd be set. Sounds a little too fancy for a gal like me. I'm super cheap, Gorgeous. When I stain my purse, I head to the thrift store to get another one. Greta, I'm pretty sure you can use Shining Monkey on anything - thrift store or otherwise.